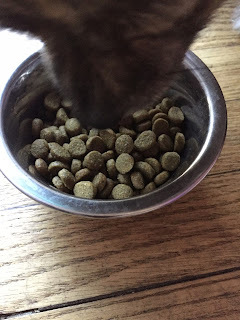 My dog says we always like to try out new kibble, and today we're here to share our thoughts on Zignature. An acquaintance of ours uses this brand, so we had heard of it through him, but it wasn't a product line we were familiar with otherwise. So, we were eager to test it out. Zignature comes in a variety of flavors such as kangaroo, lamb, whitefish, trout and salmon, pork, and catfish. We went with something traditional that we were fairly confident the dogs would like: turkey. The first three ingredients in the turkey recipe are turkey, turkey meal, and chickpeas. We prefer foods where meat is the first ingredient, so that line up is a thumbs up for us. This is a medium size kibble. We like that the size is versatile so we could use it for our smaller dogs and medium size one, as well. We took a photo with a pinky finger so you can gauge the size. A 4 pound bag of the Zignature turkey formula is currently $10.99 on chewy.com. A good price for a good food. Since we initially sampled the Zignature, we have already bought a second bag (a 13.5 pound bag!). It was a big hit with all our dogs, and even a dog we babysat also loved it. We're pleased to give this kibble four out of four paws up and have already put this kibble into our regular rotation.